The Department was founded in 1978 following a proposal by Dean Peter Likens to combine the Plasma Physics Committee, an interdepartmental doctoral program, with the existing Division of Nuclear Science and Engineering. The original nine members of the faculty were: C. K. Chu, Herbert Goldstein, Robert Gross, William Havens, Shayne Johnston, Leon Lidofsky, Thomas Marshall, Edward Melkonian, and Gerald Navratil. Founded as the Department of Applied Physics and Nuclear Engineering, and led by its first chair, Robert Gross, the new department developed a broader applied physics program, including solid-state physics, quantum electronics, and applied mathematics in addition to its core areas of plasma physics and nuclear science. Building on this base developed through the 1980’s and 1990’s, the Department evolved to its present structure greatly benefiting from recent events that elevated the Department’s visibility and impact. 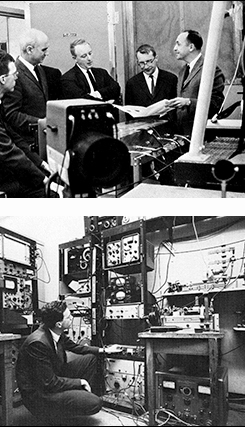 First, in 1993, the Medical Physics Program was established. In 1997, the Fu Foundation, in endowing the School of Engineering and Applied Science (SEAS), identified applied mathematics as one of the four focal disciplines to be supported by the endowment. Because of the faculty’s commitment to both applied physics and applied mathematics, the Department changed its name to the Department of Applied Physics and Applied Mathematics in 1998. Secondly, in 1997, Professors Aron Pinczuk and Horst Stormer became the Department’s first jointly budgeted faculty appointments with the Department of Physics in the area of solid-state physics. Shortly afterwards, in 2000, the Department expanded its role in mathematical earth science by creating two jointly budgeted faculty members with the Department of Earth and Environmental Sciences (DEES). The final event to shape the present Department structure also occurred in 2000. Dean Zvi Galil placed the Materials Science and Engineering Program of the Henry Krumb School of Mines within the Department of Applied Physics and Applied Mathematics as part of an overall effort to modernize and restructure SEAS. Today’s Department of Applied Physics and Applied Mathematics is viewed as one of the real success stories of SEAS. The Department’s faculty size has grown from the original nine to today’s 31. It is a vital and coherent group of active scholars, heavily involved in several interdisciplinary research areas including nanoscale science, advanced scientific computing, earth science, plasma physics, and materials for information technologies. The Department has an annual research budget of $7 million. The Department’s unity, harmony, and spirit of mutual cooperation are well known in SEAS. Members of the Department’s faculty have been awarded three Sloans, four Guggenheims, two Packards, one Nobel Prize in physics, one Gordon Bell Prize in scientific computing, and two Buckley Prizes in condensed matter physics. Members of the Department’s faculty play leading roles in the Columbia Nano Initiative, the DOE funded Plasma Physics Laboratory, and the DOE funded Center for Terascale Computer Simulation. Our materials science program has developed sequential lateral solidification (SLS): a new materials process creating high-quality crystalline silicon films on glass or plastic substrates having a potential for major patent income. The Department has the responsibility for three undergraduate majors: applied physics, applied mathematics, and materials science and engineering, and it hosts graduate programs addressing a broad range of topics in these three fields. Since 1998, undergraduate and graduate student majors have continually increased, exceeding 160 students for the first time this year. Graduates from our Department’s programs have become leaders in industry, research, academia, and business. The Department is grateful for the significant support of its friends and alumni. The Fu Foundation has endowed a chair in applied mathematics, a junior faculty research fund, a scholars program, and SEAS. The Ju Tang Chu and Wu Ping Chu Foundation has funded an applied mathematics laboratory and the departmental office renovation. Over a period of years, the late Mrs. Luella B. Slaner provided support to several young faculty members and their research to understand high-temperature plasma physics and to use strong magnetic force fields to produce safe, clean, and practically unlimited fusion power. In 2001, Dr. Jane Faggen established the Robert Simon Memorial Prize awarded annually by the Department to the graduate student who has completed the most outstanding doctoral dissertation. Created with alumni support, the first Robert A. Gross Scholar was named two years ago, providing financial aid to an undergraduate major in the Department.